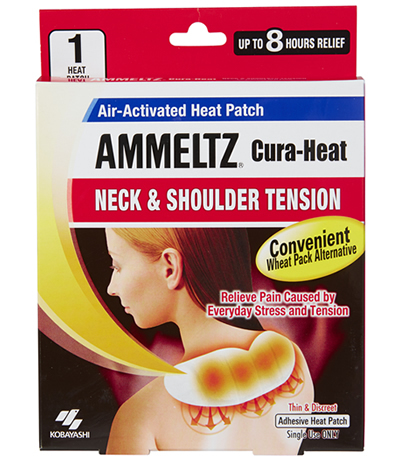 Ammeltz Cura-Heat Neck and Shoulder Pain are air-activated heat packs that provide targeted, warming relief to muscular, joint and abdominal aches and pains. The heat packs provide up to eight hours of targeted warming relief from pain. They are flexible and uniquely shaped to contour to the neck ensuring warm relief to both the back and sides of the neck and shoulders. They can be attached directly to the skin at the site of pain, heat radiates through increasing circulation, decreasing stiffness and relaxing sore muscles. With no heating required, Ammeltz Cura-Heat Neck and Shoulder Pain patches are portable and easy to use. Simply open the sachet and apply directly to the skin and heat will radiate through to the source of pain. The self-heating system includes ingredients iron, activated carbon and water. When these ingredients come into contact with the air, they oxodise and produce heat. They ingredients have been specially formulated to ensure constant heat. Ammeltz Cura-Heat Neck and Shoulder Pain patches are fragrance free, non-medicinal and so thin they can be discreetly used anywhere.